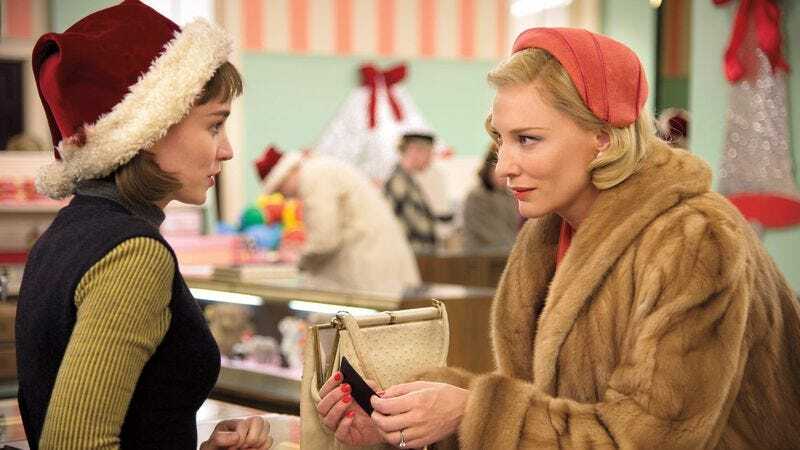 Todd Haynes’ Carol is a film about love and longing, the latter of which is a feeling Chicago cinephiles know all too well, as they’ve been looking forward to seeing the acclaimed director’s latest drama for quite some time. By assembling a classy team of talent both in front of (Cate Blanchett, Rooney Mara) and behind the camera (Carter Burwell, Edward Lachman), Haynes has crafted one of the year’s most anticipated films. Our own Mike D’Angelo reviewed the film when it opened in New York last month and called it “something remarkable,” a moving portrait of two women “without a trace of winking or archness.” Carol finally makes its way to Chicago on December 25, but, if you’re lucky, Christmas can come early this year: The A.V. Club and The Weinstein Company have and opportunity for you to see it for free on December 21. For your chance to win a pair of passes to the advance screening, simply follow the link here and enter your information. Remember: Advance screenings are often intentionally overbooked, so be sure to arrive early if you want to guarantee yourself a seat. An official plot synopsis and trailer for the film can be found below.